“A teacher reveals the past, presents the present and creates the future" but we barely know how! Today we kick-off our ChalkTalk segment where we will have tête-à-tête with and pay our tribute to those teachers who touch thousands of lives. 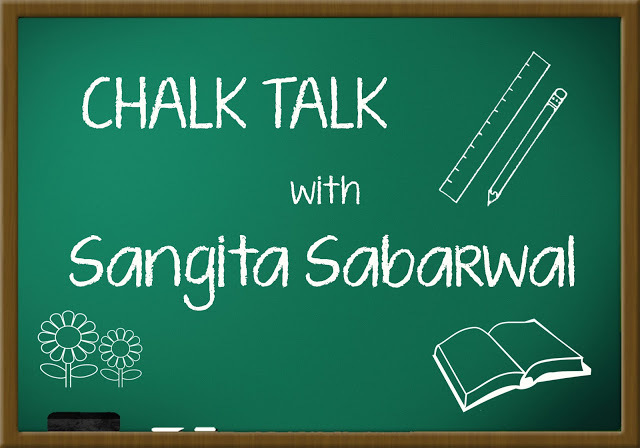 Mrs. Sangita Sabarwal, Principal of S N Sidheshwar School,Gurgaon,with 25 years of experience behind her opens up about what it takes to create a good teacher and a better school. "Passion to become a teacher grew with my age." No other profession is as noble as moulding & chiselling the minds & personalities of kids. Your joy knows no bound when you are able to present to the society a perfect human being. Training the very young minds has always been my passion. I was a student then when I used to admire my teachers. At that time I did not know what ensues in the teaching profession. As I grew up, I found myself attracted towards teaching. Passion to become a teacher grew with my age. What is the best thing about having a career in this industry? The best thing about this industry is the joy of watching those minds grow. It is strange but true that with every individual whom we teach we also grow. We also learn while we teach. This is the most magical thing about the profession. Teaching is my passion, hence classroom activities fascinate me. However, outside the classroom my interests are varied. I like analysing the problems of students & teachers, providing them solutions. Counselling students is my favourite interest. "Smart classes are like bridge talks." Do you stay current in your teaching methods? How? When was the last time you changed your style of teaching? Explain. As I have already mentioned above, there is no single approach to impart education. One has to keep moving with the change. Change is always welcome as it removes stagnation & brings in novelty.I have a rich experience of teaching for about 21 years. But I have always found that keeping pace with time & keeping abreast with changes in pedagogy always brought good response from the students. I have always been open to new techniques of teaching. Smart classes play a very significant role in the teaching learning process. Incorporating technology in education is the demand of today’s pedagogy. It is proving effective also but my take on this issue is that it cannot replace the personalized teaching taught by the teachers. The smart classes have set modules; there is no flexibility. The personalized teaching can be changed according to the demand of the situation. Smart classes are like bridge talks. These cannot start the thinking process in the minds of the students. "Now the role of the teacher has changed from that of a mentor to that of a facilitator." In my opinion, the best attribute of Indian Education system is that it is all inclusive. From kindergarten to secondary level all the subjects including two languages are taught. Up to Upper Primary Three languages are taught. This provides provision for learning classical language/foreign language/regional language etc. Education system has changed radically. Earlier it was teacher centred. The teacher was the provider of knowledge. Now the role of the teacher has changed from that of a mentor to that of a facilitator. With the advent of technology, knowledge can be obtained at the click of a mouse. Sometimes it appears that the students are smarter than the teachers only their knowledge is immature & lacks the maturity of adult perspective. Struggling with classroom management, arguments in class, one student dominates the classroom, either the students are voluble or extremely silent, too much of parental interference, aggression & disrespect by the students & updating & coping with the constantly changing educational scenario are some of the challenges of a teacher these days. "If creating individuals is what the main aim of the present day education system is all about, then the K-12 is the answer." Do you think that the Indian k-12 education system is equipped to produce future entrepreneurs? If yes, then how? If no, then why not? K12 is becoming more significant because it is a type of education that prepares kids for their years in college and future employment. Statistics show that parents who choose the right K12 educational plan for their kids have helped them to choose and get into better universities and obtain better jobs. If creating individuals is what the main aim of the present day education system is all about, then the K-12 is the answer. "The only change I would like to bring about is 100% promotion policy"
Modern education system has been revolutionized for better. Students are more informed & confident. The only change I would like to bring about is 100% promotion policy which has rendered students indolent. Qualitative performance has scaled down. A little anxiety about work is also very necessary. Do you have a classroom management plan? Different strategies used in different combinations with different groupings of students will improve learning outcomes. Confrontation with the students always results in resentment. Your polite & friendly behaviour will disarm him & he will reciprocate you in the same way. Always have positive expectations; give them a gentle push without hurting their sensibility. Don’t shout at them in front of the class. Speak to them after the class. Yelling brings forth our own weaknesses. "I believe private tuitions are a great burden on the students..."
Private Tuitions have become a craze with the parents as well as students. Parents feel relieved as their wards are in any way learning & revising their work which otherwise they would not be doing & waste their time chatting or watching TV. I believe private tuitions are a great burden on the students as well as on the pockets of the parents. There is no surety that the students who attend tuitions will perform well. These do not leave time for self study which is very essential for thorough understanding of any subject. If you were given a chance to switch professions, what would you choose? Educationalist, Mentor and Teacher!! I would not like to switch professions.